This is an interesting and powerful article that should be read, pondered, and eventually acted upon. I recently spent a week with over 800 children in Peru, many of whom have had such a mom as described below. Having a precious child in our own extended family that found shelter in a Christian home after having such a parent, I will offer an end note to suggest a redemptive way or two for us to "act upon" this message. I only know Ken Herman through his column in the Austin American-Statesman. He is an engaging and entertaining writer, but at times his column is so weird I want to do some fact-checking to be sure he's not just making up stuff. I've joked for a long time that among the reasons to be nice to your kids is that they'll pick the nursing home you'll be in and you're always in jeopardy of winding up in Bedsore Manor, where a "60 Minutes" crew will drop by to ask questions like "Have they fed you this year?" Here's another reason... to be nice to your kids: There's a good chance they'll write your obituary. Then he quoted from an obituary that said a woman is survived by the "children whom she spent her lifetime torturing in every way possible." 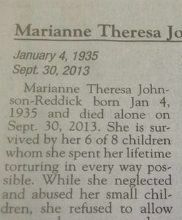 Marianne Theresa Johnson-Reddick [was] born Jan. 4, 1935 and died alone on Sept. 30, 2013 [correct date is Aug. 30]. She is survived by 6 of her 8 children whom she spent her lifetime torturing in every way possible. While she neglected and abused her small children, she refused to allow anyone else to care or show compassion towards them. When they became adults she stalked and tortured anyone they dared to love. Everyone she met, adult or child was tortured by her cruelty and exposure to violence, criminal activity, vulgarity, and hatred of the gentle or kind human spirit. On behalf of her children whom she so abrasively exposed to her evil and violent life, we celebrate her passing from this earth and hope she lives in the afterlife reliving each gesture of violence, cruelty, and shame that she delivered on her children. Her surviving children will now live the rest of their lives with the peace of knowing their nightmare finally has some form of closure. Most of us have found peace in helping those who have been exposed to child abuse and hope this message of her final passing can revive our message that abusing children is unforgiveable, shameless, and should not be tolerated in a "humane society." 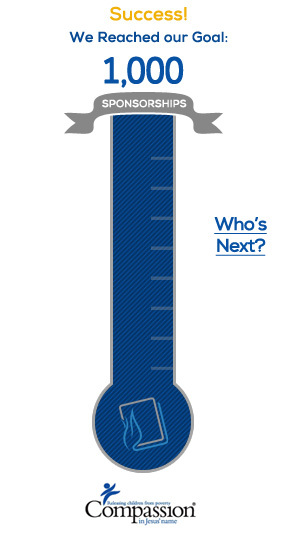 Our greatest wish now, is to stimulate a national movement that mandates a purposeful and dedicated war against child abuse in the United States of America. Wow! A daughter and a son have confirmed that they submitted this paid obituary to the Reno newspaper, and that it represents the feelings of their siblings. Not knowing the people or their circumstances, I can't do anything but accept the testimony as sadly accurate. At least the children survived to tell their story rather than being drowned, or shot, or left to die in an oven-like car. Patrick Reddick, the son who co-authored the obituary, said he and his sister told their story to focus on child abuse, and they were surprised when it went viral and they heard from people all over the world. "Even people who weren't abused said they went home and hugged their children and said how much they loved them. And they told their mom, 'Thank you for being a good mom.'" Noting that "It's hard to even imagine that there are uncaring, abusive parents," Herman was reminded of a prayer written by Rabbi Robert Saks of the Washington, D. C. area. The prayer is offered "in memory of a parent who was hurtful..." and asks God "to subdue my bitter emotions that do me no good...."
To Ken Herman I say, "I apologize for daring to doubt your column's accuracy." And to my children I say, "Please, spare me the obit, and spare me the prayer." The prayer is offered "in memory of a parent who was hurtful... " and asks God "to subdue my bitter emotions that do me no good...."
Support a child through Compassion International. This proven program is ransoming lives all over the world and you can develop a relationship with a child that will lead to eternal differences. Working through church projects around the world, Compassion helps educate, feed, and inoculate children whom you get to write and even visit. Actively care for wounded, abandoned, abused, and forgotten children. I have several recent articles about a trip to Peru that offer insight on one way to help: go on a structured mission trip with people experienced in serving children who have faced life's worst difficulties and are in a place where they are open to receiving grace in the name of Jesus. Get involved with Big Brothers, Big Sisters and be a "Big" to a child needing a loving friend and mentor. Or be a lunch buddy to a kid so that he or she knows there is someone out there for them when times are tough, decisions are hard, the peer pressure intense, and a single parent is doing all he or she can to bless that child, but just needs a little help. Get involved in foster care or foster to adopt work in your community. You can go through a Christian adoption agency or you can go through training with your county or commonwealth. This is not for the faint of heart, but there are so many children who are not babies that need to be loved and are waiting for a forever family that will love them past their scars. Help pregnant moms without support know there are other options besides abortion or raising a child alone when she cannot adequately provide. Get involved, financially support, and give encouragement to the workers with a Crisis Pregnancy Center or adoption agency in your area. Here are two I know and love: Christian Homes and Family Services (Texas) and Christian Family Services (Florida). There is likely one similar in your area. People were bringing little children to Jesus for him to place his hands on them, but the disciples rebuked them. When Jesus saw this, he was indignant. He said to them, "Let the little children come to me, and do not hinder them, for the kingdom of God belongs to such as these. Truly I tell you, anyone who will not receive the kingdom of God like a little child will never enter it." And he took the children in his arms, placed his hands on them and blessed them (Mark 10:13-16). "Tortured!" by Phillip Morrison is licensed under a Creative Commons License. Heartlight encourages you to share this material with others in church bulletins, personal emails, and other non-commercial uses. Please see our Usage Guidelines for more information.